Well I really like the idea otherwise I wouldn't have posted it up. Well it soundss nice to me. Yes, a membership area for your site is a good idea and something that is on our list of requested features. We hope to work on making this possible in future! Hey Monique, i know synthasite is working hard to help us. would we able to make some pages public, and some pages accessed only by members? And how the system would work? i mean would it let us choose and allow to accept people, or it would automatically generate passwords for users? I wanted to do thad a while ago! its a great idea!!! We are going to introduce part of what you are asking for very soon. You will have the option to password protect your entire site, or certain pages on your site that you select. You will assign a single username and password that you will need to share with members. One idea would be to add a Wufoo form for them to register, they could fill it in and you could send them the password! This feature is literally around the corner. A week or two and the most! the ability for people to register on your site and be assigned their own username and password. The reason for this is that we have to make it possible for each user to have their own database for their websites, and the database has to be able to "move" with them wherever they take their sites. This is not a trivial task, as you can imagine! So although we are full well aware that there is huge popular demand for this feature, building it is going to take time, and we don't have a release date yet. We don't like to make promises we can't keep, so we will let you know when we have made a lot of progress on the feature and we are nearly ready to go live with it. In the meantime we hope the password protection feature is going to come in useful! We are excited about making it available with the next SynthaSite release. a week or two for the protected pages..!! Wo.Ow, i got a reason to party..!! What do you mean by the database has to "move" with the user's site? Do you mean if someone downloads their site to their computer and uploads it to another web host, that they will have to be able to have the database go with them too? Or did you mean something else? Monique is not currently online but I am quite sure that is what she was referring to. it has been more than two weeks, but the only addon I could find was a chatroom. is this what the membership thing was? Hi Jake. Please see my response above, in which I explain the difference between password protection and a membership feature. The password feature was released a few weeks ago (you can find this feature in the site manager tab in SynthaSite). The membership feature is going to take a lot longer, and we don't have a release date for it at this time. I am sorry for any misunderstanding that might have arisen, and I hope this clears things up for you. I like the idea, hope it will introduced and release soon. im josue and i like this idea is cool...show me how to make members cause i have a cuzin and she wants to be a member. Are you wondering about how other people are able to sign up to your site; unfortunately there is not a way for people to become members of your site as we do not yet have a members only feature. You may be interested in a tool called Google Friend Connect; here is a link to your tutorials: Google Friend Connect. Thanks for the links Srdjan. Love Yola...and cant wait for this new feature...!! What are the other features y'll planning to include soon!!?? about the mebership thing i have gone to this page http://www.yola.com/tutorials/google-... and i wnet to the google friend connect but it goes to the gmail.com login. is that right?? Can you tell me from what place you are being sent to gmail.com? Have you been able to go through the tutorial, at which place are you unable to proceed any further? go to the link that i poseted earlier and go to google friends connect. and then get a submit button. so there is a lot of work to do of making this feature possible and it will take quite a few months to do it!! Are you considering making available this option? (I mean the full-fledged option,i.e,Member can choose their name and password? This has been a popular request for some time, and it is certainly on our list of features we would like to develop. To help us out, can you tell us more about what you would use it for and how you would like it to function? I pass this feedback to our developers so it is certainly worth taking the time to let us know what your needs are. Maybe something like authpro.com instead Built-in, like a cgi script maybe? i have members and i would like them to have their own login so i can keep the password protection to myself to use it for admin purposes . 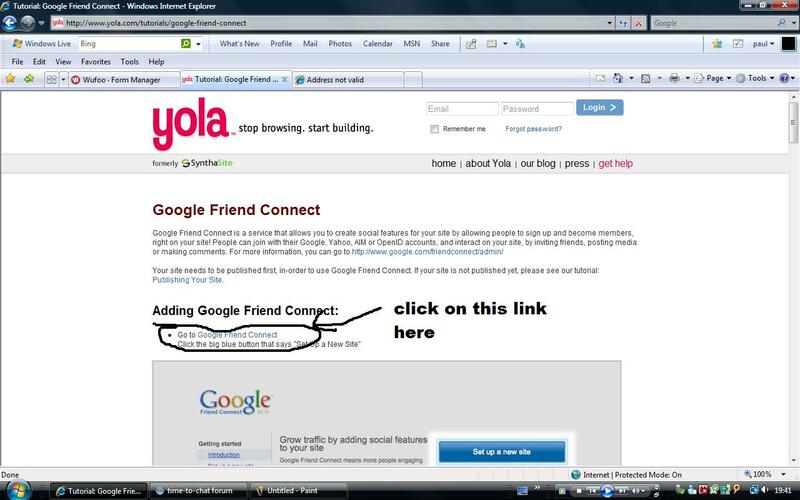 2. go to www.yola.com and then create a new account. 3. do what u have to do and then bobs ur uncole u r done!! At the moment it's not possible for users to have their own logins for your site. If you password protect your pages (this is a different password to your login one) then only members can view your site, but it is the same user name and password for everyone. Please let me know if I have misunderstood your question.